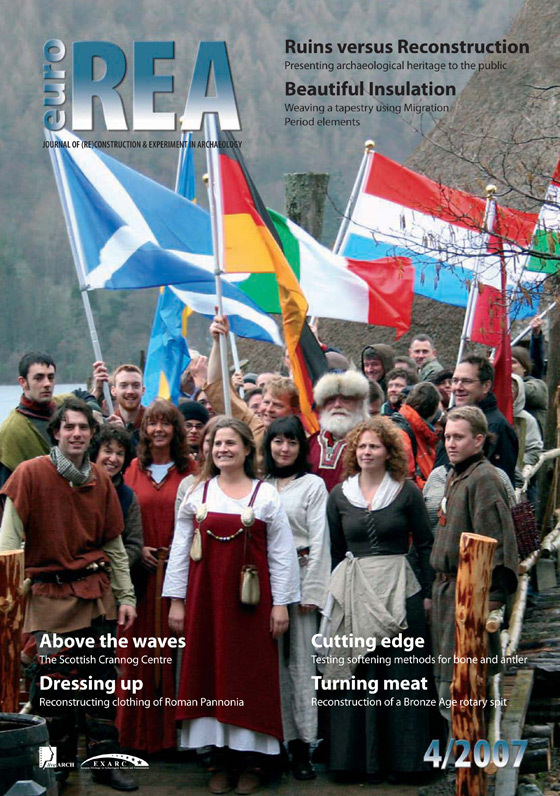 The year 2007 was a year of changes for EuroREA. Responsibility for its publishing moved from the Czech Republic, where it was founded by the indefatigable Dr Tichý, to EXARC. The editors hope that this change will give the journal a further chance to grow and reach the wide European audience. To present to our readers the wide range of activities connected to centres of experimental archaeology and archaeological open-air museums it was decided to shorten for print some of the specialised scientific articles. Full versions are available on our website. We would like to introduce to our readers at least some of the high quality projects and research aiming to raise historical awareness. Among them belongs a 3 year project liveARCH, a project common to eight members of EXARC, concentrating on the presentation of archaeological findings. For a different point of view, Catalonian Clara Masriera’s PhD research looked into the public value of visits to archaeological sites in comparison to visits to archaeological open-air centres. Softening techniques in prehistory of the North Eastern part of the Polish Lowlands in the light of experimental archaeology and micro trace analysis.